There was, I thought as I listened to Valery Gergiev conduct Prokofiev’s music to the ballet of CINDERELLA, something radical about it. It seems actively to resist Romanticism, despite the fairy tale it depicts, and to veer full scale into the abstraction and self-consciousness of Modernism. It is only at the moments of literal romance – in the sense of love yearned for, fallen into and fulfilled – that the abstract gives way to the effulgent, the formal to the emotional. This is crucial, for it is scarcely possible, absent a variety in the music, that so familiar a tale could sustain itself, in a serious and unsentimental way, for the better part of three hours, even counting a pair of intervals. The pleasures of fancy and sentiment, subsistent in both score and story, are all the stronger, in the end, for having been taken apart and put together again, like toys disassembled and rebuilt. The Mariinsky Theatre’s 2002 production, receiving its New York premiere at BAM, has its own unsentimental brilliance, not just in Alexei Ratmansky’s choreography, but in the staging and design. Ilya Utkin’s and Yevgteny Monakhov’s set is pure Russian Constructivism, like something channeled from Meyerhold circa the 1920s. At the center is a great rolling wheel that serves as the face of a clock (ticking down to midnight) when it is upright and as a massive chandelier when it stays level. On either side are metal scaffolds that roll away for the royal ball and back in again for the workaday world. Although contemporary, the upper-class costumes, as opposed to the rags worn by Cinderella and the Fairy Tramp (as the Godmother is called), are designed with a hint of deco-stylishness; the front curtain is decorated with a modern skyline, which is also faintly evocative of nouveau. This is not the universe of a child’s imagination, but another sort of fantasy, the desire of the servant for the elegance of the master, not, to be sure, a progressive one, but one that is socially true, and to the story as well. If the set is Constructivist, the choreography is, more often than not, Deconstruction, full of sharp angles, dissonant stabs, and points of imbalance. The effect can be intensely symbolic, especially when interacting with the bold colors of the design (including lights by Gleb Filshtinsky), more a dance of forces and affinities than a story ballet. There is a fusion of thought and sensation that the exceptionally skilled corps, singly and individually, manages to make beautiful without falling into prettiness. 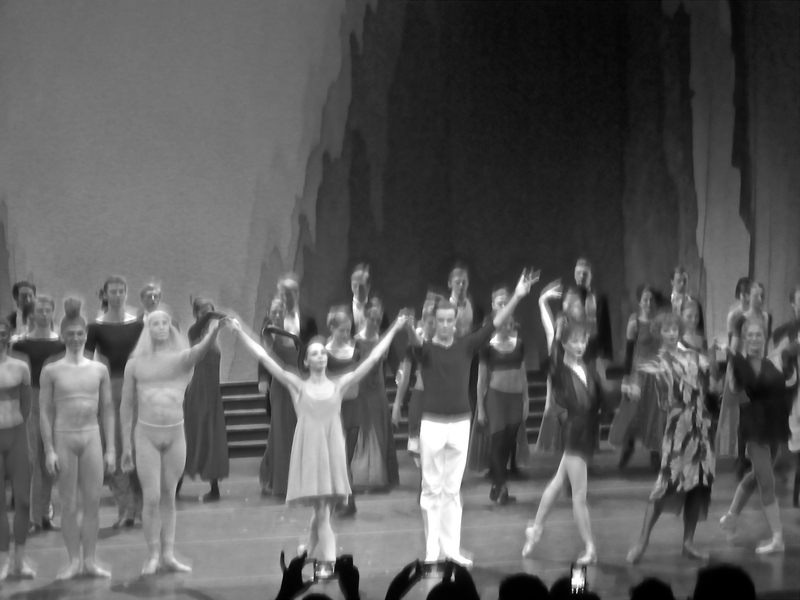 And then there is, or was, Diana Vishneva, who on Saturday night made her one appearance during the current run. In her Cinderella are all the general virtues of her dancing – the deep pliancy, the uncaught breath, the durable ease – as well as the defining irony of her work, which is realization of style by means of the natural. The absence of visible calculation in her dancing is thorough; she is captive to the moment, psychologically and physically. When Cinderella appears at the ball, she covers her face in unbelief and just stands there; yet still she is dancing; and when she moves again, conversely, it is with a kind of stillness. At the end of the rush to escape the ball by midnight, she tumbles onto the stage as though pushed from a train, barely able to right herself. In Cinderella’s debut before the Prince (beautifully danced by Konstantin Zverev), and in their reunion at the end, it is not possible to distinguish, in her, the art from the feeling, the beauty from the empathy. Her naturalism contrasts, somewhat, with the deconstructive tenor of the whole, but fits the story of a young woman who stands both economically and socially apart, before, in her apotheosis, she experiences the ultimate unity. For information on events at BAM, click here.